This duplex apartment has one spacious bedroom with plenty of storage. The bedroom has a contemporary finish and large double glazed windows provide fantastic light in each room. The open plan living area includes a comfortable sofa and stylish arm chair with reading lamp. There is a raised dining table with matching stools located in the corner of the room perfectly positioned to appreciate the fantastic dual aspect views to the south and west of the city. 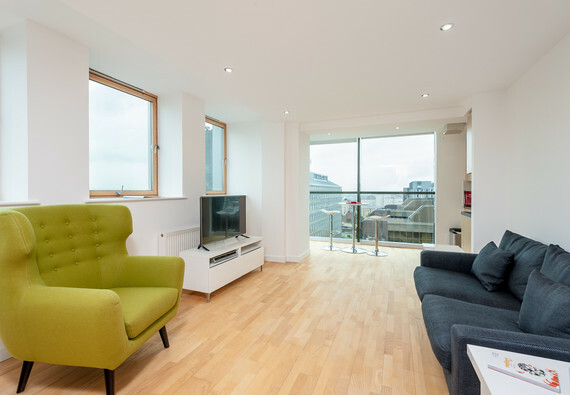 A 40" digital TV and free wireless broadband are also included within this apartment for no additional charge. The kitchen is adjoined to the living area and includes all modern integrated facilities such as washing machine, microwave and dishwasher. The cupboards contain plates, glasses, cutlery and everything you would need to cater for home cooking. Central heating/hot water will ensure warm and comfortable stay at all times of the year. Our guests are provided with fresh white towels & bed linen during changed weekly for longer stays. An iron & board, clothes horse and hair dryer are also provided in each apartment. Sleeping arrangements There is one double bedroom. Parking notes There is no private parking with this apartment. We can offer discounted parking vouchers for nearby multi storey car parks which would allow guests to park for £6.00 per 24 hours. Accessibility statement This property is a duplex, therefore it would not be suitable for wheelchair users due to the stairs. There is an elevator from the ground floor to the property level and there is a walk in shower in one bathroom. No reviews yet for Pinnacle 1.